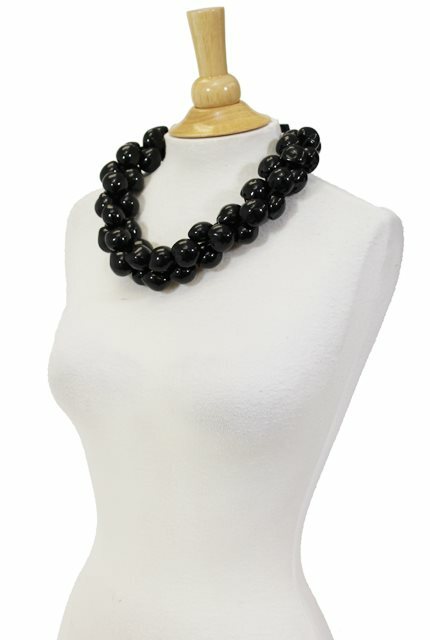 This kukui nut lei is made with a total of 54 kukui nuts that were polished to a glossy shine and braided into a beautiful choker. Historically, kukui nut leis were only worn by royalty; usually by the ali'i (reigning cheifs of an entire island). Today, the kukui nut leis are worn in hula performance or given as a congratulatory gift. These are perfect for graduations, weddings, and parties. This product is only sold in black. #17 Pink/Yellow/Red Silk Plumeria Lei 40"
Beautiful necklace. I have not had a chance to wear it yet, but I tried it on and look forward to using it in my next performance.